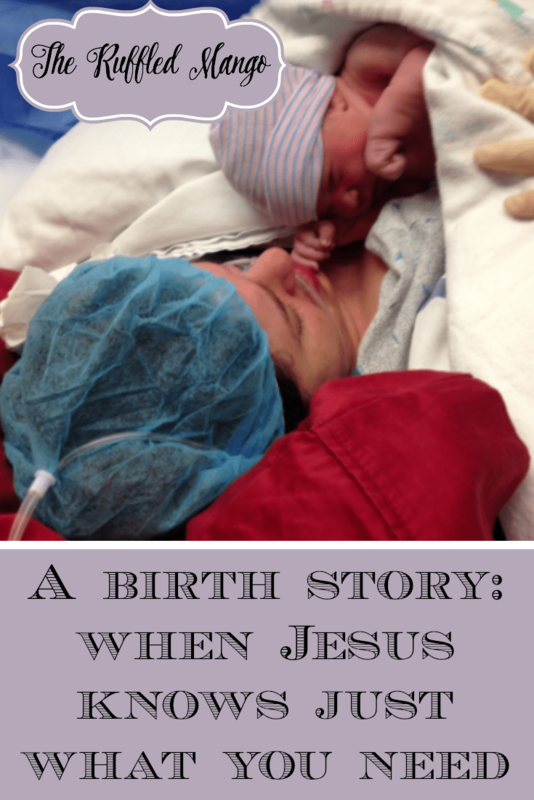 It’s only taken me 13.5 months to get to a point where I can write about our birth story. You would think that the smart move would have been to record the experience soon after it occurred, while the memory is still fresh. I’ve narrowed it down to three reasons that I couldn’t do that until now: 1) I was too emotional (in a happy way), 2) I couldn’t remember a lot of it, and 3) I was too emotional (in a sad way). Our experience was most definitely not what we planned or wanted. Yes, we went home with a beautiful and healthy baby and for that I thank God. Everything that happened between week 36 and walking out with that healthy baby was a disaster, though. I think it’s so, so important for women to feel free to share their own stories, no matter how good or bad, easy or difficult…natural or unnatural. I’ll be writing another post soon on dealing with a birth experience so drastically different from what was so desperately wanted. When I was around 12 weeks pregnant I met a new friend, Jennifer, who had semi-recently had a baby. I got to know her over the course of a few weeks and picked her brain about her own pregnancy, labor, and delivery. She used a midwife (something I had never considered) and had a 100% natural, drug-free water birth right in the middle of her own living room. She. Rocks. She hooked me up with her midwife and after lots of reading and research we decided that was the route we wanted to take as well. We were living in Dallas temporarily at the time, but as soon as we got settled in Kansas I found a group of midwives that I felt comfortable with and get this-they worked in a birth center. As in, we planned to have our baby not in a hospital, but small building in an office park, in a homey room with a jacuzzi, a midwife, maybe a doula, candles, oils, and with no drugs in sight. Total granola fest, right? We took tours, childbirth classes, water birth classes, breastfeeding classes, and read book after book after book on techniques, methods, and approaches to a natural labor and delivery. All that to preface what eventually happened, which was most definitely not natural. I had a pretty easy pregnancy…mostly. 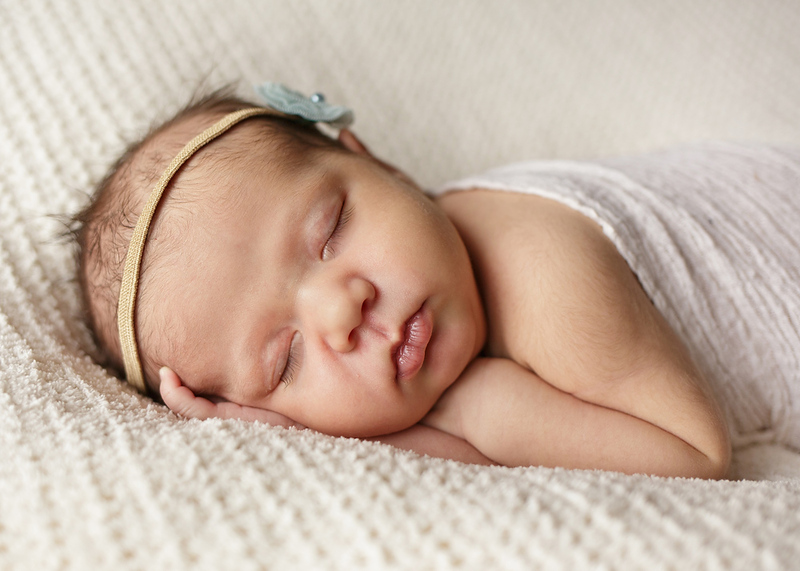 Minimal morning sickness, no crazy cravings, good checkups. Around week 36 while we were at church I noticed that my ankles were extremely swollen and they and my legs were discolored. On the way home we stopped at Walmart (basically one step above consulting WebMD, right?) to check my blood pressure and it was a bit high. I felt fine and the swelling eventually went down, but later that week I checked it again and it was still elevated. My mom, my friend Heather, and I were in a group text talking about it and they were nagging encouraging me to call my midwife about it. I thought it would be silly and annoying of me, but I did it anyway and was put on temporary bed rest just to be safe until my appointment the next Monday. At my checkup they took my blood pressure and it was normal. I told the nurse about it being high recently and she decided to use another cuff and got a much higher reading. The midwife ordered some lab work and kept me on bed rest until my results came in and sent me home with a prescription for blood pressure medication. 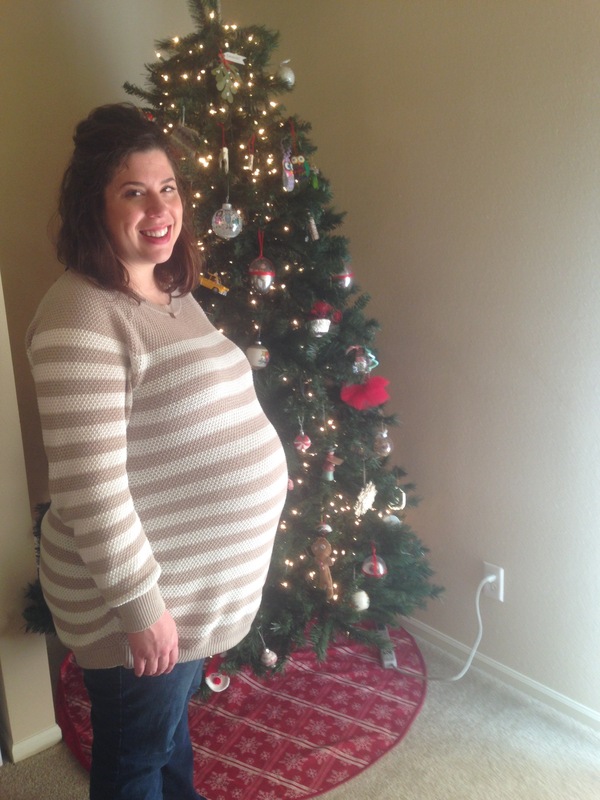 A few days later, the day after Christmas, I went back and learned that I was right on the cusp of the danger zone for preeclampsia. So, indefinite bed rest and more tests to come. My next tests showed improved numbers (which the midwife didn’t expect), but I stayed on the BP meds. And the couch. The next round of tests, however, was much worse and I was creeping much closer to preeclampsia. At that time the midwife went ahead and transferred my care to another provider equipped for a high-risk delivery. So I knew that I would be giving birth in a hospital. Not what we wanted, but accepted it pretty quickly. The new midwives I was transferred to were amazing. I had much more of a connection with them and through all of the bad news that kept coming they always put me at ease and were constantly encouraging. Yes, there were tears, but there was much more laughter. I know that God sent me to those women for a reason. The day that I hit week 39 I had a morning appointment for an ultrasound and checkup, along with test results. The ultrasound was fine, but as soon as we saw the midwife she told us that my results had just come in, I was preeclamptic, and we needed to go to the hospital right then for an induction. We sure hadn’t figured that into our day or I would have eaten more than toast with peanut butter and fresh fruit for breakfast! I was immediately scared and emotional, but the mood was lightened when through my tears I cried that I hadn’t packed my bag, but most importantly my yoga pants were dirty. Because priorities, right? She gave me permission to throw my pants in the washer with strict instructions not to wait on them, that Kevin could return and finish them up, and get to the hospital pronto. We probably dilly-dallied a little longer than we should have, but I think my heart needed that little bit of time before what was to come. Because I knew when we walked down that long hallway that it was not a happy situation coming up. I would give you a play-by-play of what happened between entering the hospital and the delivery, but it was mainly uneventful. Y’all. My cervix. It’s just…I can’t. Apparently mine is broken. Let’s just say if I’ve heard the term “Fort Knox” once, I’ve heard it a hundred times. It took a good 30 hours after the start of my induction to realize that the medicine they were giving me was never going to work on my body. I eventually dilated to a one (seriously after like two days) and was given a foley bulb catheter that is supposed to dilate to a three or four (so I was told, don’t quote me). Ideally the bulb comes/falls out easily when the cervix has dilated, but the thing is when mine fell out, I was right back down to a one. I’m pretty sure that was late Friday night. I went in Wednesday afternoon, so you do the math. 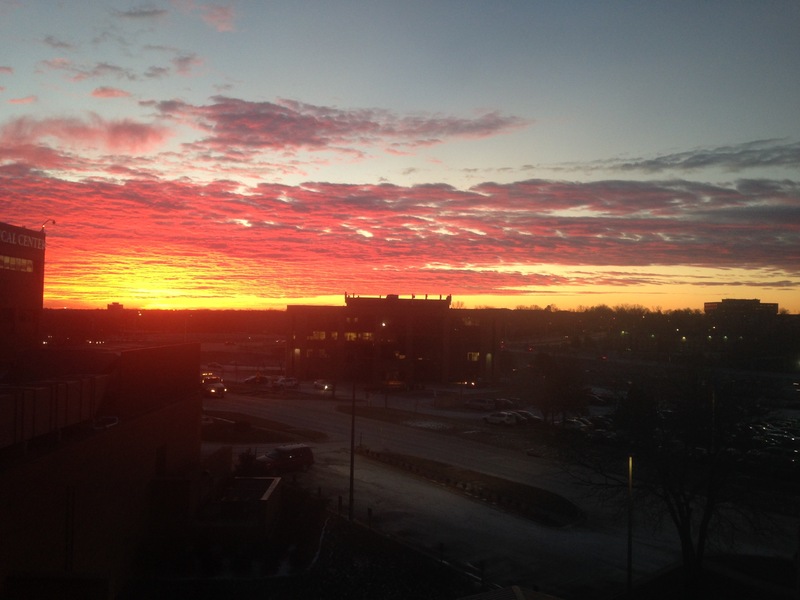 I woke up to this amazing sunrise the day after I was admitted. I thought, “Yes. This is a beautiful day to have a baby.” Um, sure, Kel. Around the same time, I requested the thing that I had unquestionably decided against for the past 39.5 weeks. I remember my midwife telling me that she had had an epidural herself when her pain was at a three. In some way I felt like that was my blessing to go ahead and get one. I still felt like a failure, though. It’s not that my pain was unbearable, but after more than 48 hours after my induction began, I was ready for some kind of rest. I remember the sweet nurse that was in the room when I got my epidural was holding my shoulders and calming me and telling me that I was doing such a good job. So when I needed to get my second – AND THIRD – epidural because the first two didn’t take, I kept asking her to keep cheering me on. There was just something so comforting about her voice and touch that I needed in that moment. At one point in the middle of Friday night I woke up and needed to adjust in the bed. I knew that the nurse would come and fix the monitors if they slid, but for some reason I decided to just wait until she came in. Well, she did immediately come in even as I was thinking the words and helped me move. She checked the monitors and calmly, but seriously, told me that I needed to move back the way I was before very quickly. She yanked the oxygen mask off the wall, put it on my face, and called for help. 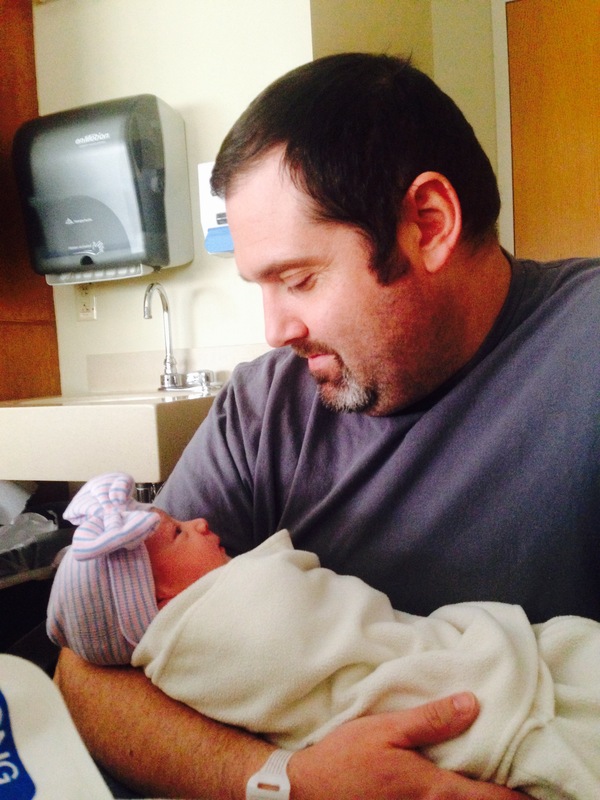 They had broken my water Friday evening and when I moved, the baby’s heart rate dropped. I’m sure it happens all the time, but it was still pretty scary. Kevin was asleep in the chair and woke up to me with an oxygen mask on and several nurses fussing about me. I’ll never forget (and I’m sure he won’t either) him propped up on one elbow, just looking around like, “Whaaaaat?” I said something along the lines of, “Just stay there! I’m fine!” Maybe not the sweetest, but that was my only little outburst so maybe it’s not too bad. 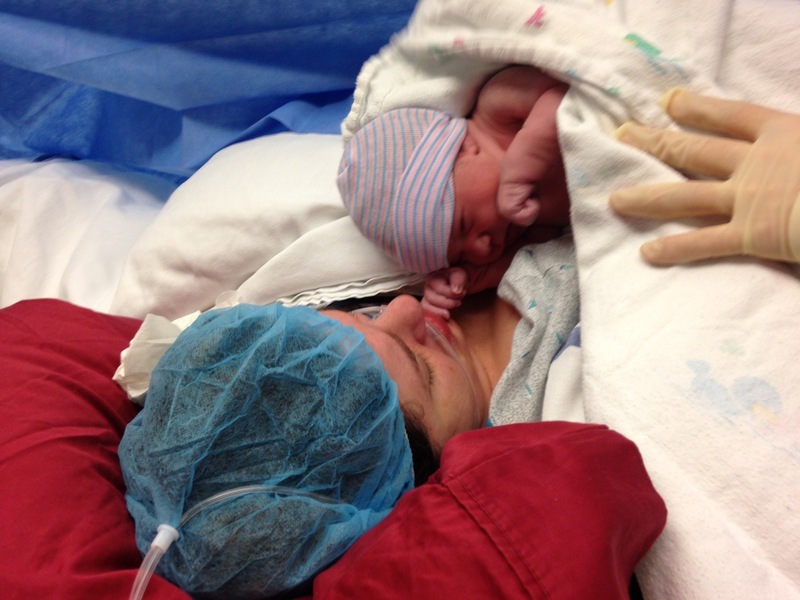 I lost a lot of blood during the c-section and my uterus wasn’t contracting back down. So those nice uterus massages new mommas might get soon after delivery? I got one about every 15 minutes. For a couple of hours. At least those breathing techniques I read all about came in handy at some point! Whoa. In.sane. And poor Kevin…they basically handed him a baby and said, “Here, take care of this pink, hungry, crying little thing. Momma needs our attention.” I remember getting to hold her and a few ladies from church coming in, but besides that all I remember from the hours after her birth is the pain. And being insanely thirsty. So much for that instantaneous skin-to-skin contact and bonding time, right? I don’t even remember nursing her for the first time. No recollection of taking this picture, but I’m glad I had the lucidity to do it! When they finally moved me to the recovery room they said I had to eat something before I could have oral pain medication. So I was trying to choke down some plain crackers and then promptly choked them back up along with all of the Sprite I had been sneaking. They put me back on Pitocin to get my uterus to go down and even though it didn’t work worth anything before, I was sure having contractions every five minutes after the fact. Perfect. The night time nurse wasn’t too satisfied with the state of my uterus and called the charge nurse to come in and check me out. She didn’t like it either so they both went to town on my now-a-punching-bag tummy. Sparing you the gory details, I’ll just say that I had been bleeding and it was…stuck. They unstuck it. I don’t think they had very good poker faces either because they paused, looked at each other with a bit of concern, and said they better weigh my blood loss. I felt tons better, though! The next day (Sunday) the doctor had me get in the shower to see how my body reacted to the heat and everything was fine until everything got black. Kevin said that I was pale, had purple lips, and was talking nonsense like a crazy lady. I tell you what, all sense of pride goes right out the window during the pregnancy, labor, and delivery process. So when they had to put my nekkidness into a wheelchair and get me in the bed I couldn’t have cared less. My blood pressure was dangerously low and I ended up getting a transfusion. THEN, I really felt better! I got a little sick Monday morning, but all-in-all was feeling pretty good. Well, as good as one can while feeling like your guts are going to fall out any time you breathe. At one point there was the lactation consultant, birth certificate lady, perinatologist, and newborn photographer all lined up in my room waiting to talk to me. My nurse kicked everyone out and put a sign on the door basically stating that if anyone wanted to get to me they had to go through her. Bless that woman. We went home the next afternoon (Tuesday) after a short delay due to a spike in blood pressure and then I blinked and now have a 13-month-old. The words above sum up the following days perfectly. In total, I had seven nurses before EJ was born and five after, not counting the nurses in the operating room. It was so obvious to me that God put each of those 12 women in my life for the specific 12-hour shift that they were with me. When I needed to be coddled (hey, it happens) He sent me a Mother Hen. When I needed to laugh and joke He sent me a fun girl with a cool name and a ton of personality. That night that EJ’s heart rate dropped and I was scared, He sent me a gentle soul that comforted me with stories of her life and being a traveling nurse. He sent me the perfect person when I wanted to throw around baby names with someone. He sent me a nurse anesthetist with a soothing voice and kind eyes peeking over her surgical mask to sit right at my head during my c-section to comfort me and who took my phone to capture those first moments. And He sent just the right nurse for me when I needed a little tough love, to buck up. Coincidentally she was the same nurse who became fiercely protective when I needed time to rest. Even through texts, Facebook messages, and visitors, He knew who I needed and what I needed to hear. I can’t help but wonder if He used preeclampsia to get us to deliver in the hospital and not the birth center. The midwife that was assisting in the OR said that EJ probably would have easily gone until 42 weeks and that with the shoulders on our 9 lb. 10 oz. little girl she thinks it would have been a pretty bad case of shoulder dystocia. I can’t imagine being in that situation in the birth center and having to take the show on the road in the middle of labor and go to the hospital. Also, had I not checked my own blood pressure after church that day who knows how long my hypertension would have gone undiagnosed? After all, the nurse that checked my BP used a cuff that didn’t give an accurate reading. The entire thing had God written all over it. I couldn’t conclude the story without crediting my midwives, Crystal and Lindsey. If you find yourself having a baby in the Kansas City area, look them up at Specialists in Women’s Care in Shawnee. Like, I seriously want to go back to the States so that they can deliver all my babies. Also, the staff at Overland Park Regional Medical Center were perfect. Top notch. They say it takes a village to raise a child. We’re still new into the raising, but I’m certain that it takes at least a village to bring one into the world to begin with.